It just seems unlikely that Playmates would allow some other company to produce movie figures in this scale when they have already been dealing with NECA for years now and know the demand for their products. There is a chance that it might be another company such as Kotobukiya. 1/10 scale kind of size with no articulation. If its NECA for 22.99 I am betting head knockers or body knockers-easy to make those an exclusive and NECA has been sending out lots of sales promos for knockers lately. The first TMNT body knockers they made, based on Mirage designs, looked cool but the quality control was awful. Most of mine have broken pieces, and one of the turtles is glued onto his base in the wrong direction. Will be an easy pass if you're right. I purchased four different sets trying to piece together a decent set over the years. If they weren’t broken, glued incorrectly, or missing pieces, they looked like they were painted in the dark. I eventually gave up. Worst quality control I’ve ever seen and that includes Funko Pops. God I hope they aren't head knockers. Actually that's why it makes sense to me. They don't seem interested in doing these type of versions themselves. Why not let NECA do it. Just collect a royalty on each one sold. They still get to make money off the items without having to make the product and deal with us grumpy collectors. Playmates have their own crappy sculptors on contracts , its al big "family"and they all help each other by hiring their pals and crapping new products one after another , it will never change because of $$$$ floating in their family. Only NECA could of done this, theyre really passionate about tmnt , they gave us mirage tmnt and now this. 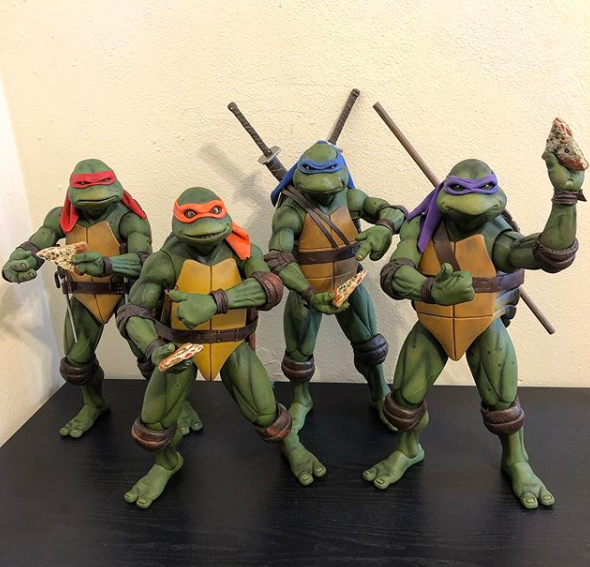 Other companies sometimes follow NECA and we did get other mirage turtles but they were first, maybe someone other than NECA will release henson turtles in the future... we will see. Im actually surprised that Eastman and Laird never pushed for properly looking figures themselves, they just accepted options presented to them, i would of done that differently with my own property, they both say they like 90s film but never pushed for movie figuresthemselves, it would boost their business.Oh well... nickelodeon does better job a this now, i dont think its a coincidence that we got so many tmnt figures after license buyout. SDCC 2018 - details incoming ? 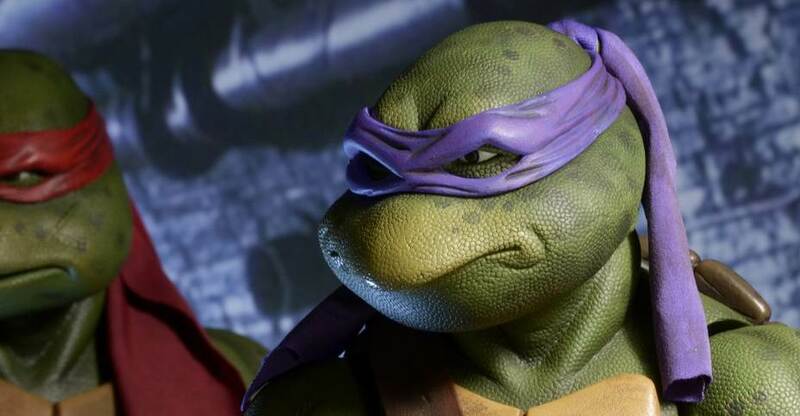 "I'm trying Splinter...it's hard to overcome because you are gone..."
Can anyone confirm that the later run Donatello 1:4 figures all have the spots on the head? I'm looking at replacing my first run one. Last edited by Otter; 08-04-2018 at 06:43 PM. I love these figures so much. As much as I’m longing for the smaller scale figure, I’ve really begun to appreciate the presence of the large ones. Agreed, the larger size helps them stand out as the centerpiece of my collection. Hey thanks! I'm with you on the smaller scale figures as well ... I would love to have those but I can't deny how incredible the original 1/4th releases are. 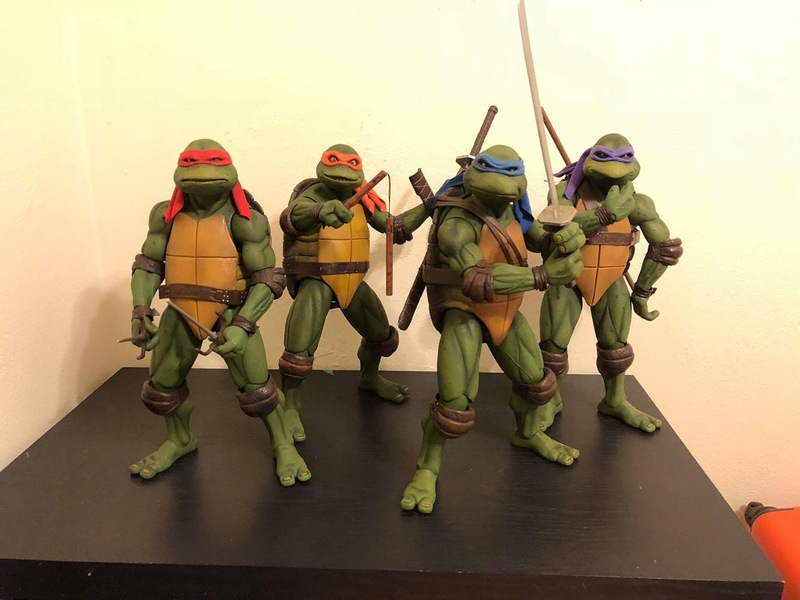 I have had really good luck with repairing 1/4 scale Ninja Turtles with broken knee or ankle joints after getting them at a fraction of their price on eBay. The hip joint break however is a complete nightmare to fix especially without a replacement joint. Are you saying you want a spotted one? i had some big spots on my raph from small neca set so what i did is used cotton swab and acetone to gently blend some spots better.Or painbrush in tight places. Acetone will dissolve acrylic paint used for the figures, this way you can get rid of these lazy spots and clean some mistakes in other places, works great. Acetone is in nail polish removal but get pure acetone , its stronger. The heroes in a half-shell just enjoying some pizza until Shredder appears for battle!